Cute and trendy, blue coloured handbag will be a great addition to your collection of handbags. Featuring an attractive design, this handbag is not only stylish, but is also eco-friendly. Made from jute, this handbag is lightweight and easy to maintain.Cute and trendy, this orange coloured handbag will be a great addition to your collection of handbags. Featuring an attractive design, this handbag is not only stylish, but is also eco-friendly. Made from jute, this handbag is lightweight and easy to maintain. We are leading Eco friendly & reusable Jute Shopping Bags manufacturer & exporter in Hyderabad, India. We can provide you good quality reusable Jute Shopping Bags at a competitive price without compromising quality. This is the cheapest item for using as an alternative of Jute cheapest bags. By using Eco friendly Jute Shopping Bags you can save both money as well as our earth. Reusable Jute Shopping Bags are common & widely popular type of jute item which is used in general purposes. If you want to customize our Reusable shopping bags please write us an E-mail with size, weight, colour, handle type & handle length of your required jute shopping bag. For best quality Reusable Shopping Bags we always maintain fabrics weight & colour. 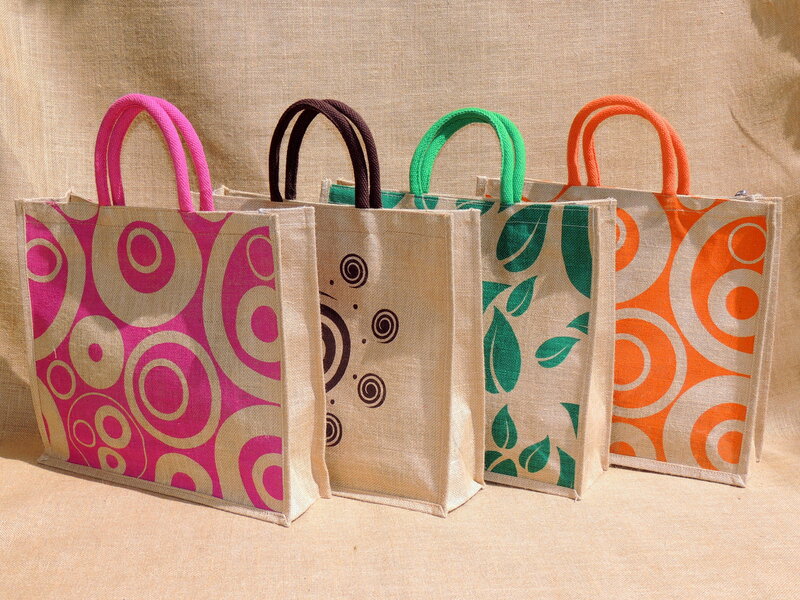 Jute Shopping Bags are mainly used in the supermarket as a Retail Shopping Bag. All the parameters can be customized as per your requirement. Somewhere Jute shopping bags are popular as jute shopping bags. Jute is available mainly in India & Bangladesh so we think it is a greatest opportunity to serve you with our Eco friendly and Reusable Jute Shopping Bags to make a Greener World.